Why did so many immigrants choose Toronto over Montréal? This map is taken from the canadian 1981 census. 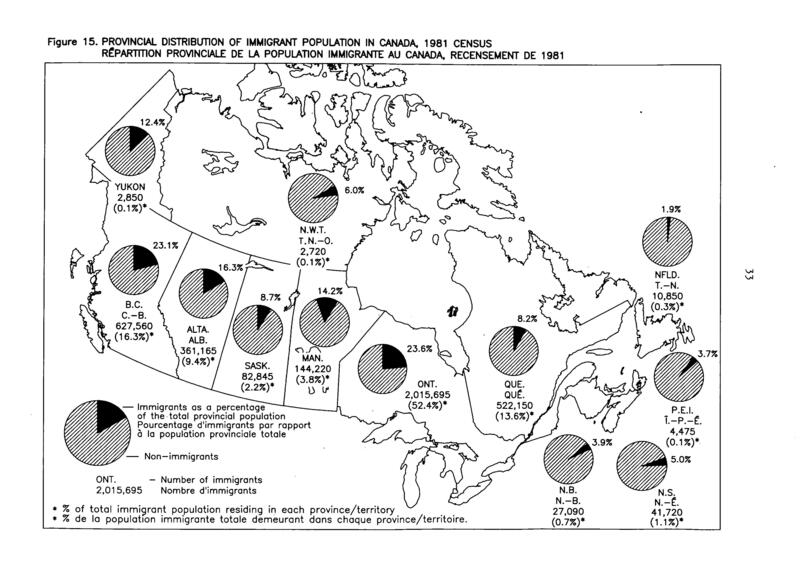 One will note that, in 1981, 52,4% of the immigrant population in Canada lived in Ontario, this by far the largest share of the immigrant population. Ontario is followed by British Colombia, 16,3%, and Québec, 13,6%. Ontario historically (and still today) drained the largest share of international immigration to Canada. That’s why, in 1981, 23,6% of the ontarian population was born outside of Canada, which made at the time (and still today) Ontario the province having the largest proportion of immigrants, and greatly contributed to making Ontario the largest province of Canada. Which still raises the question : why did so many immigrants choose Toronto over Montréal? Cette entrée a été publiée dans Uncategorized, et marquée avec Decline of Montréal, Montréal, Toronto, le 25 février 2015 par Michel Patrice.